The meteorology is the science that studies the behavior of the phenomena that occur in the atmosphere over time, so that they can foresee its evolution. And all scientific study of the atmosphere means above all collecting accurate weather data. Our senses and especially the sight and touch enable us to estimate a large number of observations. For example, we can see the amount of clouds in the sky or determine wind direction by the movement of leaves or a column of smoke. All these observations are called sensory observations. However, our senses are not enough and we have to resort to the meteorological instruments to collect the valuable data. For example, while a person can determine if the air pressure is rising or falling, you cannot know the exact value of it, for which you need to consult an instrument. In this case, the observations are called instrumental observations. Some of the instruments can be incorporated in professional or home weather stations and other are used as separate meteorological devices. 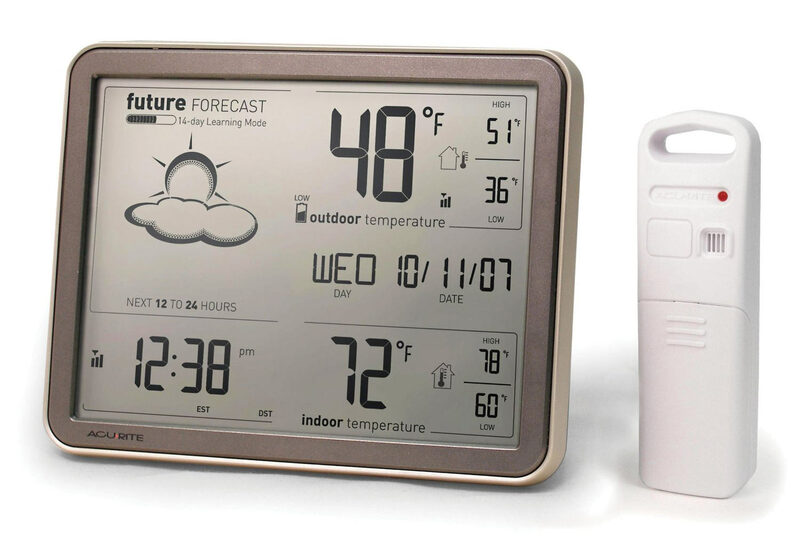 Learn bout the home weather stations and how to track your local weather data. Find out about how to track temperature remotely and over the Internet. Bellow you can find a list of some of the most commonly used tools for tracking atmospheric conditions. Transmisometar measures the degree of attenuation of the light beam at a certain distance (usually it ranges from several meters to 150 meters) as it travels trough water or air. And on this basis the tools makes objective calculation about current viability. The transmissometer has a light source and a detector at a certain (known) distance. The light emitted form the source is received by the detector and then converted into an electrical voltage proportional to the intensity of the light. The transparency is determined by measuring the proportion of the light that was send form the source and then recorded by the detector. Sometimes the transmissometers are also called telephotometers, transmittance meters, or hazemeters. 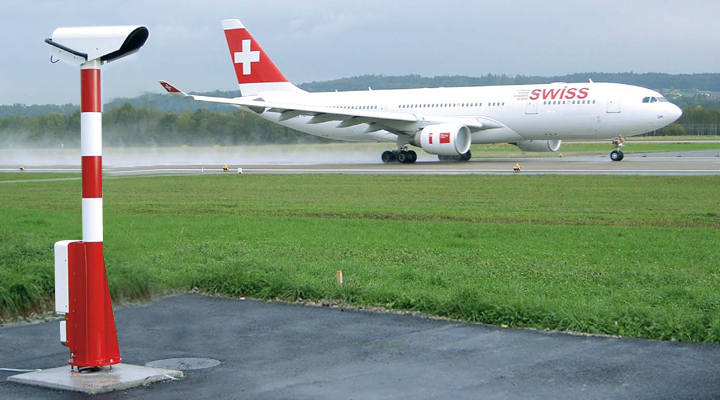 The transmissometers are used on airports and or stations. 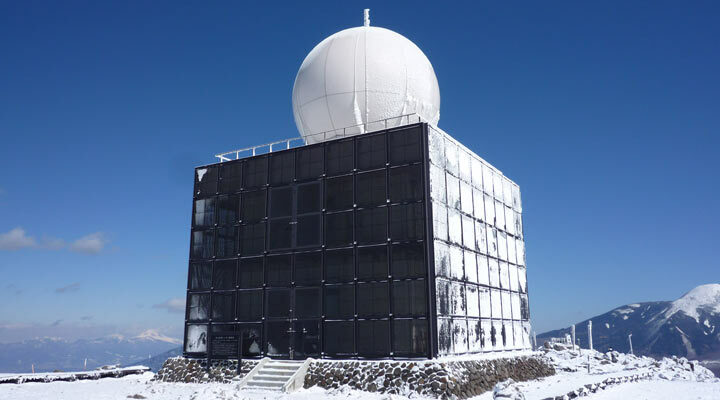 A Stevenson screen is a box, made of a double layer screens and it is used to shield meteorological instruments when there is precipitation or the instruments are exposed to direct heat radiation from outside sources. This shelter allows free passage of air around the temperature and humidity sensors. Most of the time the Stevenson screens is painted white to reflect the sun’s radiation. 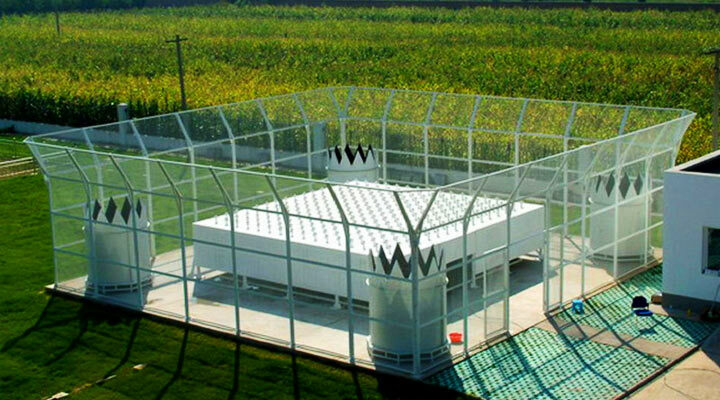 The Stevenson Screen is one of a very few designs that is recommended by the World Meteorological Organization in their aim to provide standardized environment in which to measure weather variables. Stevenson screens are also known as an instrument shelter, cotton region shelter, a thermometer shelter, a thermoscreen or a thermometer screen. The screen was invented in 1864 by Thomas Stevenson. Barometric pressure changes with local weather. Rising pressure means fair weather while falling pressure means poor weather. Lidar (English: LIDAR or LiDAR, LADAR), is a technology for measuring distance and remotely obtaining information about object in a distance. A laser is used to illuminate the target and then the reflected light is analyzed. 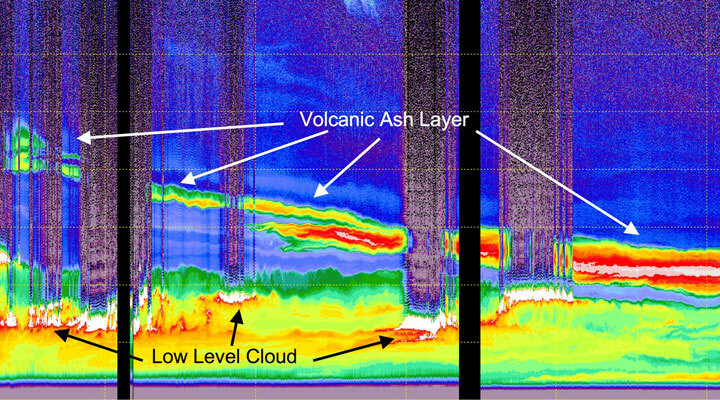 In meteorology the Lidar is used to perform a range of measurements that include profiling clouds, measuring winds, studying aerosols and quantifying various atmospheric components. Earlinet network of ground-based lidar stations has lots of lidar images and data, so be sure to check them out. 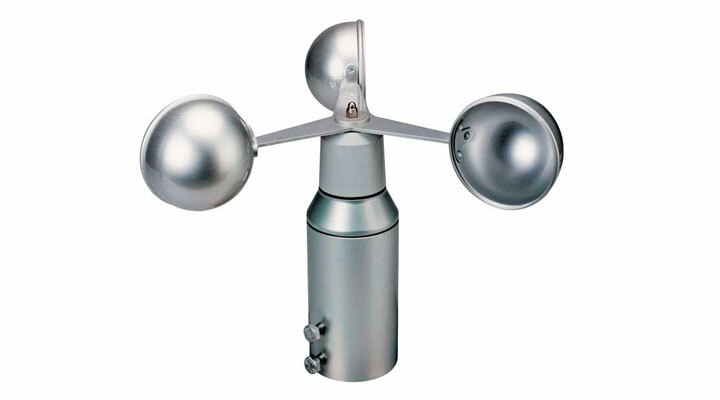 The anemometers are devices designed to determine the speed of wind. They were initially used primarily for measuring the speed and direction of wind. Today, except in weather stations, they are widely used in determining the average speed in ventilation systems built in the industrial and residential buildings. The thermometer is a device for measuring the temperature. The thermometers are using various physical properties such as thermal expansion of gases, liquids or solids to determine the current temperature. The two important part of thermometer are: the sensor in which some physical change occurs with temperature, plus some means of converting this physical change into a numerical value (e.g. the visible scale in glass thermometer). All skycam is a stand-alone Astro and weather video device enclosed in a weather proof dome that provides wide view at the entire sky. All day all night rain or shine images from the all-sky can be viewed on the TV captured on to a laptop or PC or streamed live over the Internet. The cameras fisheye lens gives you a 180 degree view from horizon to horizon. You can use this live video to observe the sunrises and sunsets, cloud activity, moving storms, starry night sky, and more. 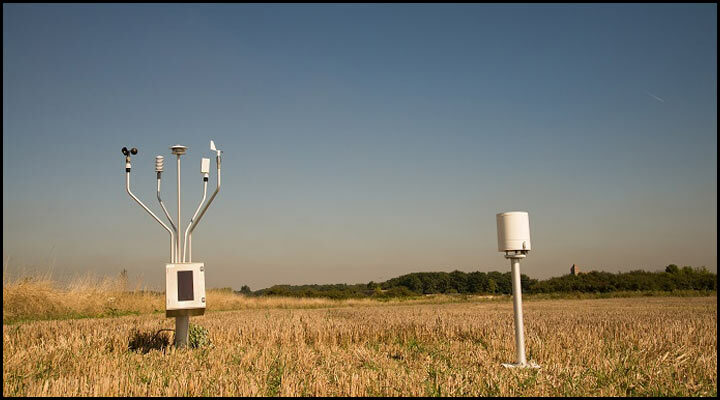 In meteorological applications camera is used to study cloud cover, UV index, timelapse photography of clouds, cloud fractional coverage, sky polarization, the computation of cloud base height, as well as wind speed at cloud heights. A rain gauge is an instrument for measuring the precipitation that has fallen in a given time interval. The rain gauge is part of every weather station. It is used in meteorology as an additional tool of the weather forecast and the climatology for the purpose of long-term statistics of precipitation. 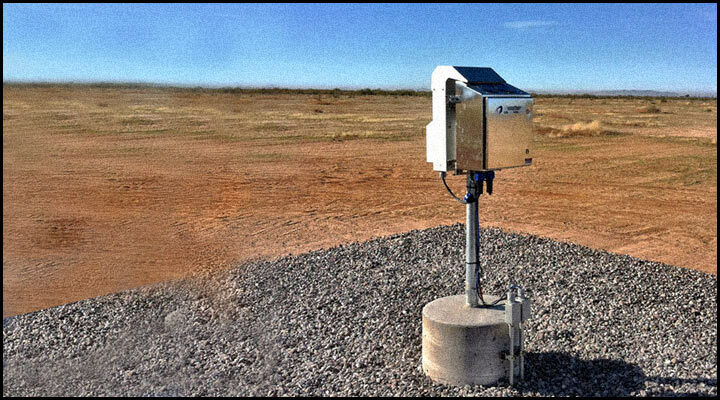 The amounts of rain accumulated in the gauge are read either manually or by automatic weather station (AWS). Ceiling projector is a meteorological instrument for measuring the height of the clouds at night. It measures the height of the cloud base. Cloud spotlight consists of two components: the sight of the spotlight and the alidade – installed at a certain distance from the projector. Spotlight consists of 430 watt bulbs, installed in protected housing. Inside the case are two mirrors. The first – the lamp above – reflects the light down, and the second – reflects the light up to the clouds. Both mirrors are set to produce a high intensity beam of light that makes a visible light spot on the cloud base. Radiosonde – a device to measure various atmospheric parameters and transmit them to fixed receivers. 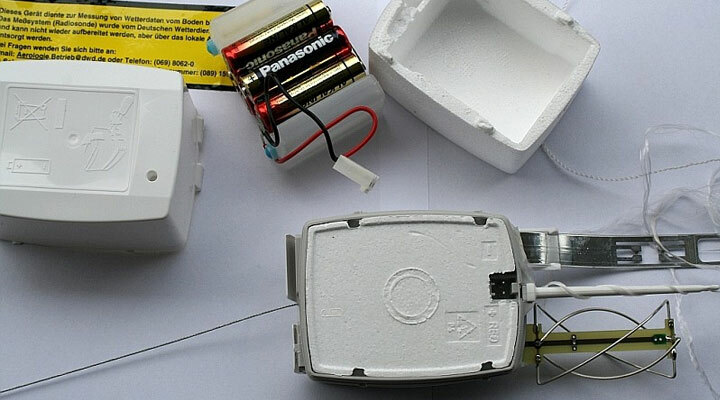 Radiosondes can run on dedicated radio frequency 403 MHz or 1680 MHz; both types of transmitters may optionally adjust the frequency within a small range around the specified value. 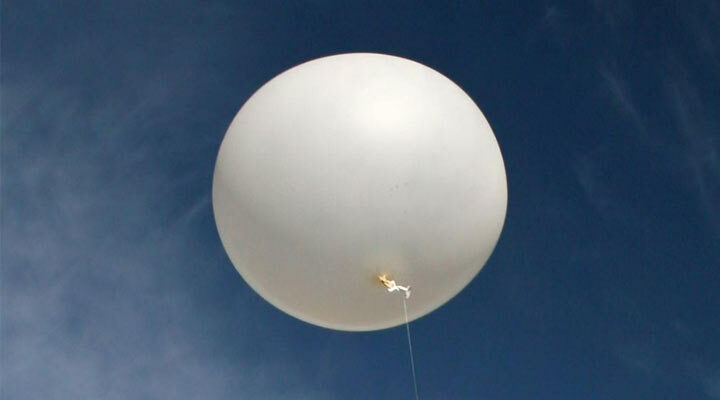 Rubber or latex balloons filled with helium or hydrogen is used to rise the Radiosonde up into the atmosphere. Sometimes radiosondes are dropped from aircraft. They are most often used in special research projects, such as the study of the storms. In case you find a radiosonde check out NOAA’s instructions. A weather balloon is a balloon which in meteorology is used for transportation of instruments and radiosondes into the atmosphere. 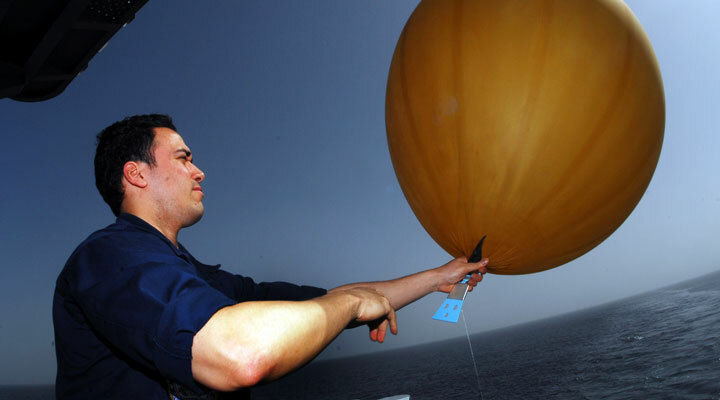 A typical weather balloon is usuallymade of rubber and has a weight of only about 200 grams. The skin of the weather balloon is very sensitive and delicate, so they must be touched only when wearing protective gloves. Even minimal damage may result in increasingly risk bursting at high altitude. The balloon is filled usually with helium or hydrogen. The probe is attached to the weather balloon at a enough distance so it won’t mess with the balloon slipstream. The weather balloon can reach heights of 20-30 km before it bursts and the probe returns with a parachute to the ground. 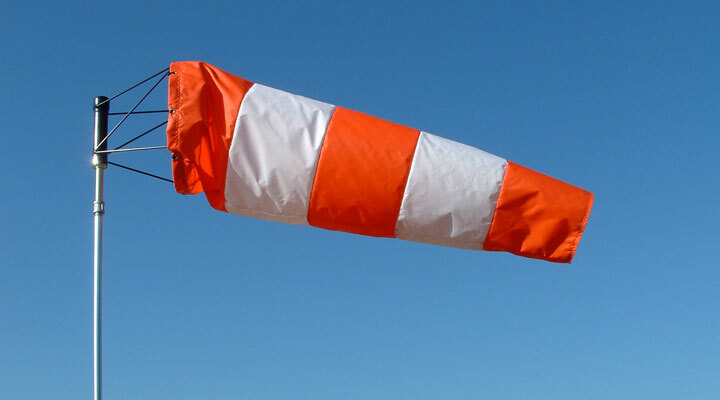 Windsock commonly used in aviation industry. Wind sock is a cone made ​​of fabric designed to indicate the direction and approximate speed of the wind. This is mainly used in the aviation industry, as well as chemical plants, where there is a risk of gas leakage. Meteorological wind direction corresponds to the opposite direction of the wind direction indicator. 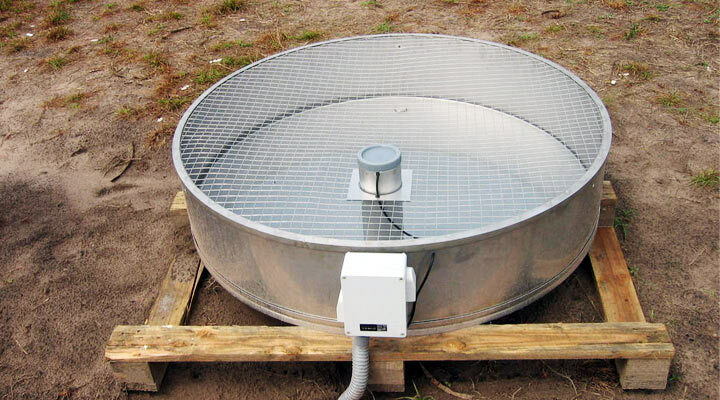 A wind profiler is a meteorological measurement system that uses radar or sound waves (SODAR) to determine the wind speed and direction at various elevations above the ground. The variables measured from wind direction and speed is useful to meteorological forecasting and timely reporting for flight planning. You can search trough wind profiler history data on NOAA’s website. Disdrometr is a device for analyzing the volume of distribution of micro particles in a controlled environment. The main application is to determine the size, speed, and number of raindrops. With disdrometer the meteorologist differ raindrops from graupel and hail. 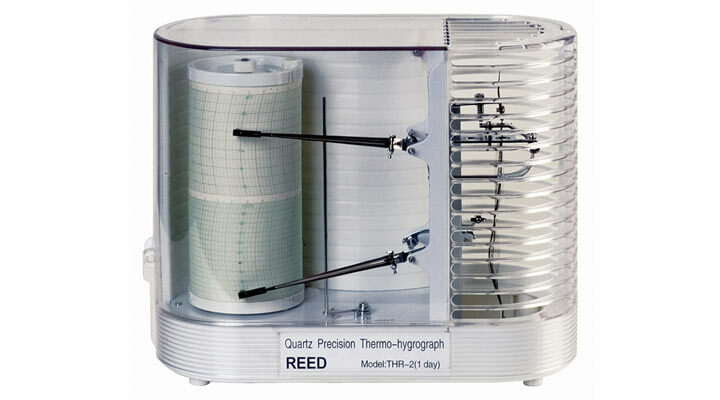 Hygrometer is a device used for detecting and measuring humidity. There are several types of hygrometers (coil, hair tension, capacitive, resistive and others), whose operation is based on different principles. Scientific American has a grate article about how to create your own hair hygrometer. A nephelometer is an instrument for determining the suspension of small particles in a liquid or a gas colloid. It consists of a light source and a photo sensor in the 90° angle to the light beam. The particle density is obtained from the amount of light reflected from individual particles. This amount depends on the nature of the particle’s shape, color, and reflectivity. A correlation between the turbidity and suspended solids is therefore varying from case to case. 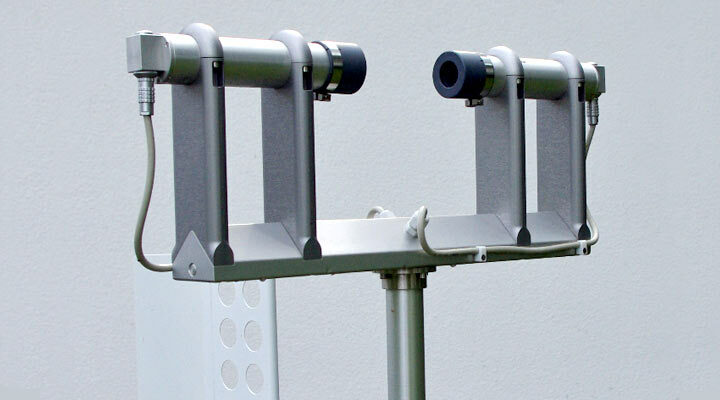 The nephelometers are used for air quality measurement for pollution monitoring, climate monitoring, and visibility. A pilot balloon is used by meteorologists to measure the height of the underside of the clouds from above the ground. It is used during daylight hours. The balloon is filled to such degree that its ascent rate is known. By measuring the time period between the start of the balloon and the moment it hides in the cloud can be determined the height of the cloud base. By tracking the trajectory, earlier with a theodolite, and today by radar or GPS , direction and speed of high-altitude winds are determined. 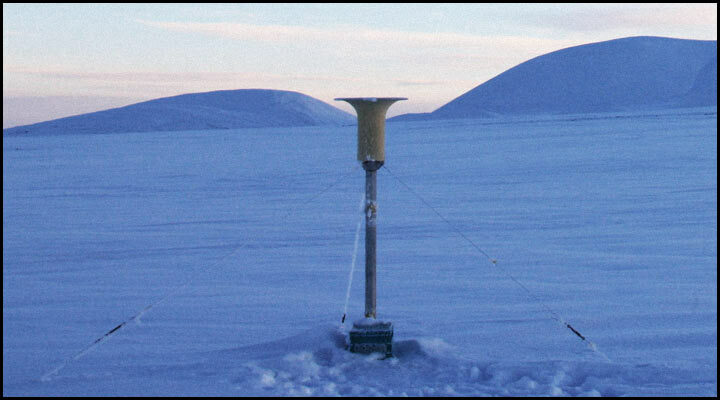 A snow gauge is a measuring device used in the field of meteorology to measure the water equivalent of an amount of snowfall. It can be equipped with a single vertical metric scale for manual check, or use some electronic system – ultrasonic, infrared, laser. This device is used in snow studies and it is similar in design to a rain gauge. Ceilometers – meteorological instruments for determining the height of the cloud base. To operate is either used a laser or other source of coherent light. Ceilometers also used to determine the concentration of aerosols in the atmosphere. 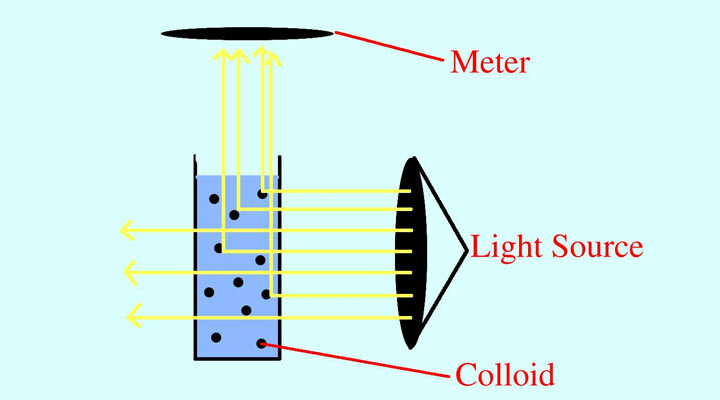 Laser ceilometer consists of a vertical laser and a light receiver, typically a lidar. The laser pulse duration of a few nanoseconds is sent up to the atmosphere. While the beam passes through the atmosphere some of its energy is scattered by the aerosol particles with a size of about the wavelength of laser beam. Because of the effect, called Mie scattering, some of the light is scattered back and captured by the ceilometer receiver. The time delay of the received signal can be converted into the distance by the using a formula. 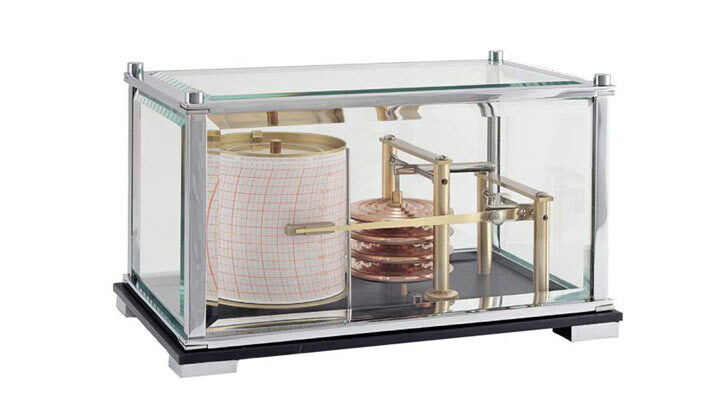 A Barograph is an instrument for recording air pressure onto a drum covered with paper for a set period of time. The resulting curve is called a barogram. The evaluation of the barogram can give to the weather expert evidence of future weather developments. Barographs are often found on ships. 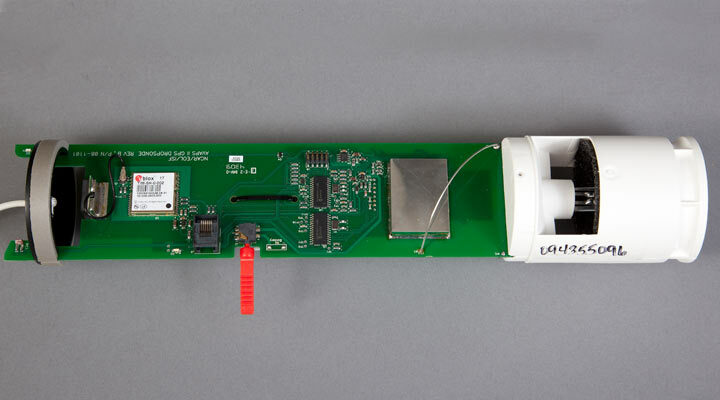 A dropsonde is a type of radiosonde. This is a device dropped from a flying aircraft, with or without parachute to collect environmental data in the atmosphere during its fall to the ground. 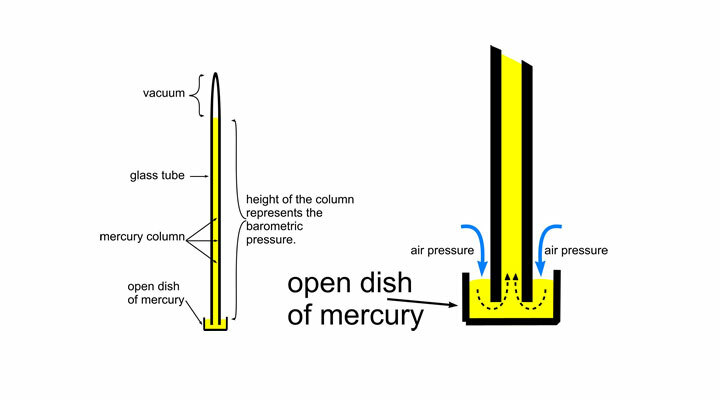 This probe is similar to a shell or a cylinder and contains all the necessary instruments. The tipical use is in hurricane research. The hurricane reconnaissance aircraft unleash many dropsondes through the weather system, and then the device receives the radio data, analyzes and transmits the results back to the forecast center. 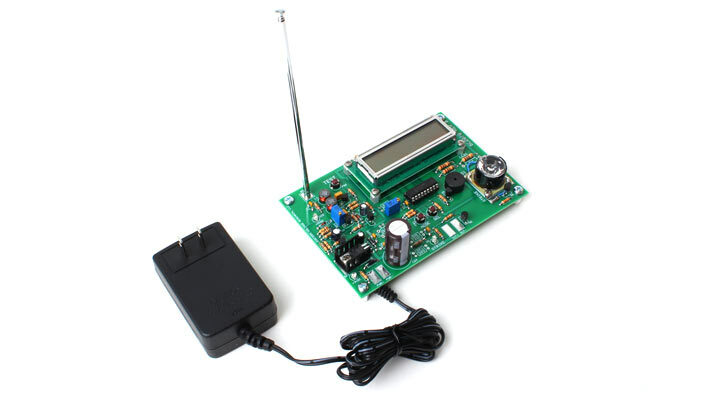 The Lightning Detector Kit is a perfect solution for anyone who enjoys building electronic kits and tracking the weather as well. 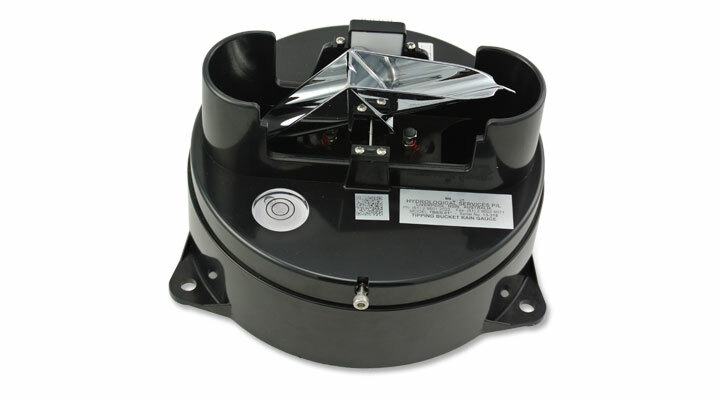 Lightning detector is a device that detects lightning or light rays produced by storms. There are three basic types of detectors: Earth system, which uses multiple antennas; mobile system, that uses a sensitive antenna usually on board of an aircraft; and spatial system. The land and mobile detectors auto calculated direction and severity of the lighting from the mounted location, using radio techniques. Terrestrial systems use triangulation from multiple locations to determine the distance, while mobile systems are using the distance estimate signal frequency and attenuation. 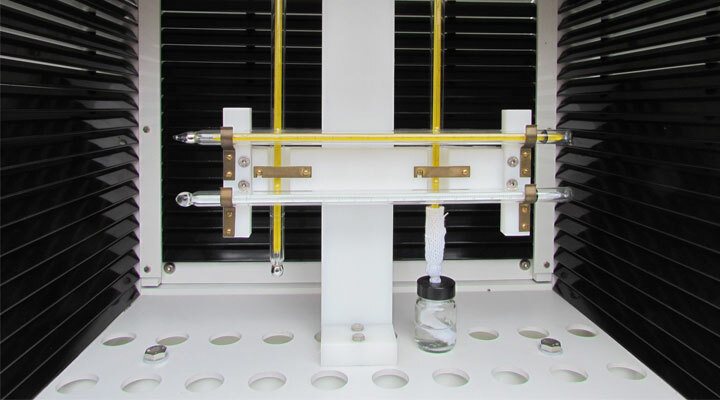 Pan evaporation instrument is used to measure the effective evaporation. Several types are used; however, one of the most used is the “Class A”. This is a cylindrical galvanized steel tank, 1.21 m in diameter and 25 cm deep. It is placed on a wooden platform, perfectly horizontal. The instrument works by measuring the volume of water required to maintain a constant level in a given time, which can be 6, 12 or 24 hours. The volume of water consumed becomes mm of water evaporated per unit of time. A weather radar or weather radar, is a type of radar used in meteorology to locate precipitation, calculate its trajectory and estimate their types (rain , snow , hail , etc.). In addition, three-dimensional data can be analyzed to extract the structure of storms and their potential path and damage. Finally, the echoes of rainfall and clear atmosphere of the meteo radar can estimate the direction and speed of wind in the lower parts of the atmosphere. The widespread use of radar during the Second World War revealed the appearance of a noise caused by signals reflected from the areas of precipitation. Investigation of this phenomenon in the US and Canada led to the creation of specialized weather radar intended for meteorological purposes. 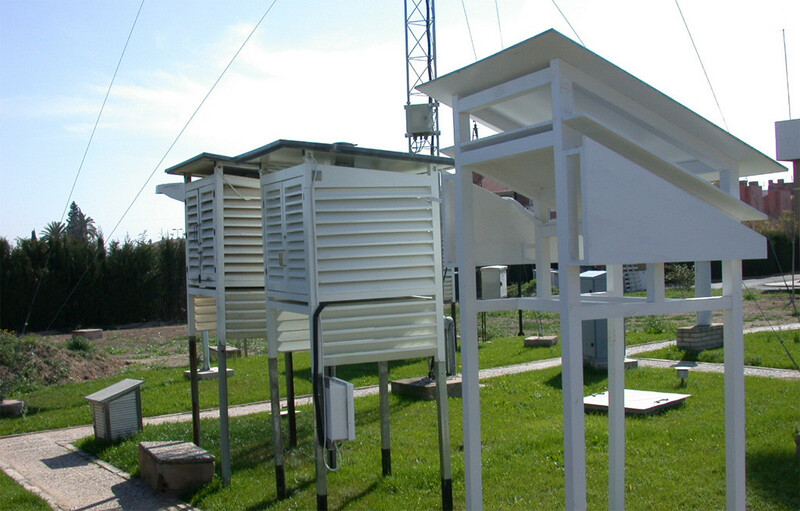 An automatic weather station is a weather station, based on a fixed or mobile site, whose sensors relate weather data to a data logger without human intervention. 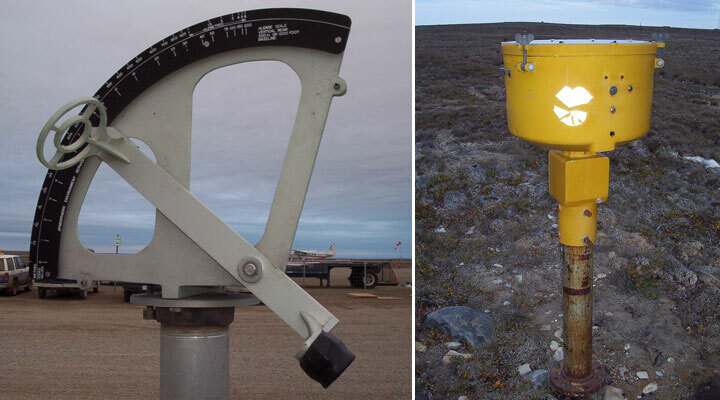 These stations were developed for use in hard to reach places (weather buoy at sea or remote areas). Developed for national meteorological services, they are now also used for weather research and amateur meteorologists. An automatic station includes, some of the sensors listed above, connected to a central processor. The data can be stored in a logger, or transmitted by cable or radio signal to one or more remote locations. The recorder and the processor are located in a waterproof housing. The station is powered by a rechargeable battery, a solar panel or a wind turbine. The number of sensors depends on the needs. A good automatic station has at least: thermometer, anemometer, wind vane, hygrometer, and barometer. Thanks for this insight on the instrument used to measure weather. This was my my first time seeing these material awesome. I can only here about these instruments. Send me more information on Geography, I want to teach Geography in the secondary school. I really love this. I am just hearing of some of these instruments for the first time. You have presented relevant material that have helped me much.